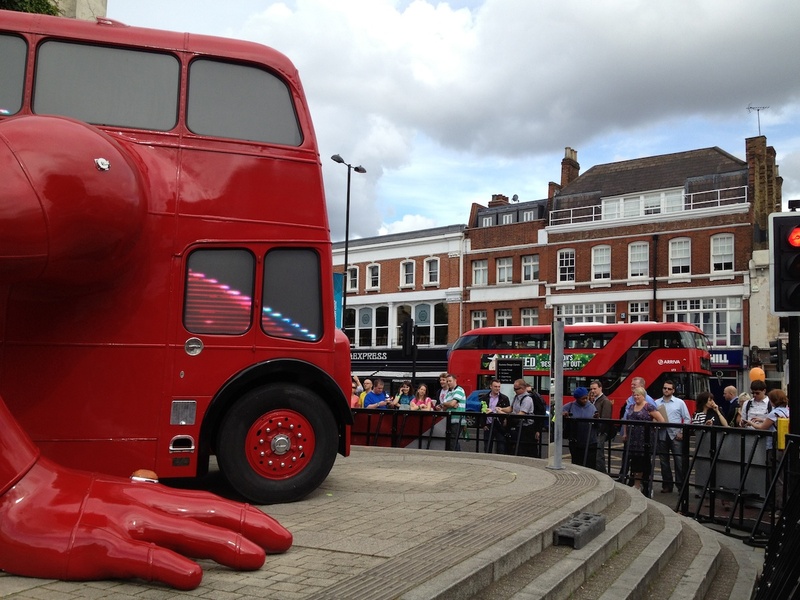 Though not the first thing that’ll spring to mind when we look back at the summer of 2012, bus-based art has been a bit of a theme this year. Okay, that’s a slight exaggeration but I’ve seen two examples which is approximately two more than usual. While Richard Wilson’s Hang on a minute lads, I’ve got a great idea… played on our fondness for nostalgia by referencing a film that tends to be thought of with a smile, David Černý’s London Booster played to our fondness for proper London buses, albeit by suggestion rather than authenticity, since – bus pedant alert – London Booster is built around a Bristol Lodekka rather than a Routemaster (I’d like it known that I’m not enough of a bus geek to have know that without the aid of Google; all I knew was that the bus wasn’t an RM). The bus wasn’t quite right in other ways too; in my experience London buses almost never do press-ups and certainly not in public. Černý is an artist with form for making slightly bonkers sculpture that definitely challenges preconceptions about art in public places. My first encounter with his work, as far as I remember, was seeing his freakish, giant Babies (2001) climbing the Žižkov Television Tower in Prague. London Booster was part of the Czech presence in London during the Olympics. The Business Design Centre in Islington temporarily became the Czech House and London Booster was installed outside it. The bus took time to psyche itself up for a session of press-ups, audibly straining at the effort; video displays in the windows suggested a churning liquid within. This is hardly work that carries any great message, but it was a perfect fit with a feel-good summer and hardly out of place among some of the more entertaining public art pieces that appeared as part of the London 2012 Festival (including Richard Wilson’s Hang on a minute lads, I’ve got a great idea… and Jeremy Deller’s Sacrilege). 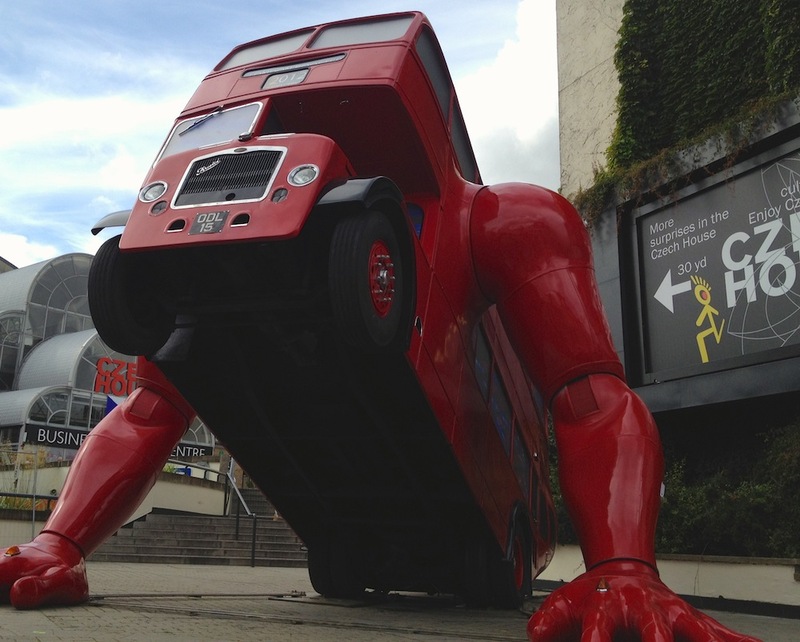 There is space for many kinds of art and it would be hard not to love a bus that does press-ups noisily on a street corner. David Černý’s London Booster watches a new-fangled Thomas Heatherwick Routemaster go along Upper Street. 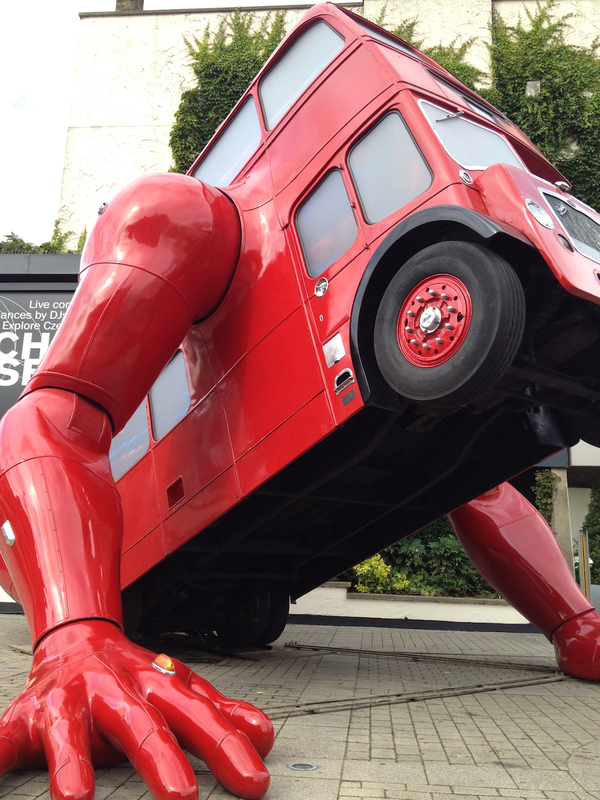 This entry was posted in Public Art, Sculpture and tagged art, bus, David Černý, London Booster, public art, Routemaster, sculpture, Thomas Heatherwick by Ann Jones. Bookmark the permalink.